The Salton Sea is California’s largest lake and is presently about 50 percent saltier than the ocean. The Salton Sea is a “terminal lake,” meaning that it has no outlets. Water flows into it from several limited sources, but the only way water leaves the sea is by evaporation. The lake is currently 35 miles long, 10 miles wide, and is located south of Palm Springs in a basin 230 feet below sea level. The Salton Sea Geothermal Field (SSGF) has a high salinity and the core temperature is high. The earth’s crust at the south end of the Salton Sea is relatively thin. Temperatures in the Salton Sea Geothermal Field can reach 680 ⁰F less than a mile below the surface. There are already several conventional geothermal power plants in the area. Runoff water from nearby farmland which contains fertilizers, pesticides and other pollutants from Mexicali, Mexico, contaminate Salton Sea and make it an undesirable tourist destination especially for beach goers. The runoff water has been decreasing and is set to decline dramatically after 2017, when more water will be transferred from the canal (Colorado River) to San Diego County and the Coachella Valley under a water transfer deal known as Quantification Settlement Agreement, or QSA, which would speed up the disappearance of the Salton Sea. As the lake level drops, exposing the lake bed and precipitating higher salinity levels, increasing amounts of dust will blow from exposed shorelines. That dust could pose serious health threats in an area with high rates of asthma and other respiratory illnesses as well as a serious threat to its multi-billion-dollar tourist trade. 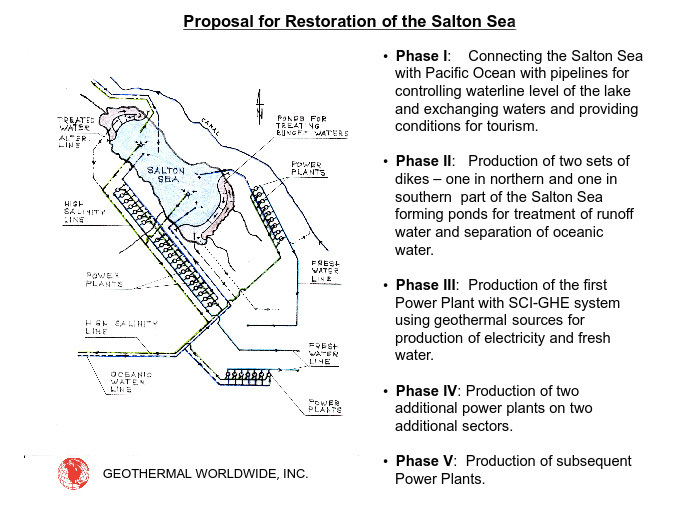 Included is an exemplary method for restoration of the Salton Sea, which implements the "Scientific Geothermal Technology" for exchanging water from a salty terminal lake with oceanic water and treating farmland runoff waters. The “Self Contained In-Ground Heat Exchanger” (SCI-GHE) system uses heat from the Salton Sea Geothermal Field (SSGF) for generation of electricity and production of fresh water. This method is self sustained, environmentally friendly and has great commercial potential.